There is good reason to believe that flexor tendon injuries in horses are not as limiting as commonly suggested and that theoretical attitudes to repair and rehabilitation are impaired by a lack of understanding of the wider pathological processes that make them so difficult to treat. In the experience of this writer, any intrusive repair process, including stem cell therapy, is not the most logical approach and generally unnecessary. Surgical interferences, including the insertion of needles, tend to the production of scar tissue, which is unhelpful, and do not redress the reality that pathological processes elsewhere in the limb have a critical influence on repair and future soundness. Tendon fibres are effectively extensions of fibres in related muscles and can be made to contract through provoked contraction of the appropriate muscle or muscles. They may also be artificially stimulated through forced contraction of related muscles acting in unison via motor units that coordinate movement. Muscles seldom work in isolation, but collectively, depending on the movement required. The brain decides, spinal reflexes help to see that the response is balanced and effective. Muscular injuries occur because of the over-loading of individual muscles through fatigue or unbalanced movement. Where coordination is lost, in other words, a required unit fails to function correctly, then the loading on the operating part is increased. This is a slightly complex issue that influences the tension applied to a tendon and increases the chance of torn fibres and tendon injury. The extent of muscular coordination can be demonstrated through stimulation of motor units located in various areas, but to appreciate the significance in relation to tendon injury a greater understanding of movement is essential. For normal, natural movement, every aspect of a limb’s anatomy needs to be functioning correctly and this applies particularly to athletic movement. A compromised limb may function pain-free as long as its limited scope is accepted. But an injured limb loses the full range of movement – partly in an effort to avoid pain – and this is a major factor in the genesis of tendon injury. The loss transfers loading onto the less elastic tendons, resulting in injury. Attempting to repair tendon tissue in isolation, without reversing the factors that precipitate injury, is a basic reason for the poor success rates as well as the excessively long rehabilitation periods recommended. While there has to be understanding and educated observation, injured horses can generally return to energetic exercise within a six week period, if effectively treated, and should progress on to full work without mishap. Of course, it is essential as part of that process to progress stepwise and not submit a horse, say, to a hard race until fully fit. Ground conditions have to be weighed for any horse and the appropriate length of time for getting one fit for any demanding task has to be respected. We refer mainly to the flexor tendons running from the knee and hock down the back of the cannon bone, which are attached to the pastern and foot. Their function is to help flex the limb and in doing this they are aided by attached muscles situated in the forearm and gaskin. Injuries can involve the superficial or deep flexor tendons, the suspensory ligament, or other associated tissues like sheaths, the check ligaments, or annular ligaments of the knee and fetlock. The most common injuries are to either of the two flexor tendons in the cannon area of the forelimb, the superficial tendon being more frequently involved. Injury can lead to bowed tendon, with an evident enlargement, reflecting chronic inflammation that is liable to further breakdown. Bowed tendon may result from an extensive injury, but also a failure to act quickly – to limit swelling and provide adequate support. Chronic tissue changes may prove irreversible and certainly limit the ability to achieve a fully successful outcome – in other words, to resume the same level of athleticism without recurrence. The outcome is affected by the immediate steps taken and by the time elapsing before treatment commences. The recognised cause of injury is over-stretching of a tendon, resulting in rupture of fibres, which is accompanied by heat, swelling and pain on palpation. This may result from any action that stresses the limb, like false, uneven or hard ground. It may occur in landing from a jump or, it can be suggested, during any similar action that drops the fetlock while the limb is subjected to pressure from above and below. The tendon is stretched beyond its natural capacity – for whatever reason. However, an essential element of this is total limb elasticity and the absorption of upward concussive forces by soft tissues, particularly muscle. An almost universal finding in horses with tendon injury is accompanying, or preceding, muscular damage, which, it can be suggested, has the effect of reducing elasticity and thus causing excessive loading on the less elastic tendon. The muscles principally affecting this are in the shoulder and neck, while the flexors of the forearm are also capable of involvement – if to a lesser extent. It is in this causation that we find a rationale for effective, quick and non-recurring repair of injured tendons. Traditional treatments have included such primitive, and illogical, methods as blistering and firing, which may increase blood supply to an area, but are incapable of having any direct effect on the breakdown of adhesions, reduction of scar tissue, or restoration of the normal anatomy of a tendon. Suggestions, too, that the best way to treat a tendon injury is to lay a horse off for one or more years simply means a reduction in a competing animal’s active life and does nothing to contribute to the clinical repair of what is not a complex limiting injury. We may look at the nature of human tendon injuries and ask why these, being fundamentally the same tissue, repair more quickly. Human sports therapists link the muscle and tendon influences in treatment. For many years, the author has treated injured tendons using muscle stimulation combined with local ultrasound or laser therapy. Electro-stimulation is still the most effective way of detecting muscular injuries and the most effective way of reversing them. In the first days post injury, the local tendon area is treated with ultrasound or laser and the leg kept in strong supporting bandages. From day two the flexor muscles of the shoulder and forearm are stimulated in such a way that the contractions are seen traversing the length of the tendon. By the end of the second week the tendon will be tight and the horse will stand walking in hand, starting with about five minutes and increasing over the course of several weeks to anything up to half an hour. In fact, most horses will stand lunging at the trot after 2 – 3 weeks, though with due caution and without over-exuberance. Decisions on progress are made based on the condition of the limb and, once the heat and pain have gone (ideally in about a month), the supports are removed while the horse is stabled. It is important to gauge progress on a daily basis and any setback simply means retrenching for a few days until the condition improves. Time is dictated by the extent of an injury, but partial injuries repair quickly and a horse can be returned to gentle strengthening work in a matter of 6 – 8 weeks, without any expectation of recurrence. Another method of achieving the same end is to use a TENS or EMS machine and attach it to the horse’s forearm for a few hours every day. The pads are set over the bodies of the flexor muscles in the forearm and these are stimulated to contract while the horse is stabled. The initial reaction is controlled by use of ultrasound or laser; or may otherwise be helped with ice-packs or anti-inflammatories; but should always include strong support for the limb. Progress is the same in both methods and decisions are based on the daily condition of the tendon, remembering the importance of support and the need for absolute control of movement until the repair is strong enough to warrant riding or turning out. However, using the second method, failure to detect and resolve muscular injuries in the shoulder and neck can limit the effect and lead to further breakdown. The full normal elasticity of the limb will not have been restored. 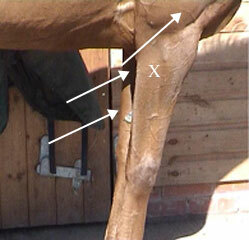 The arrows on the above scans show an area of chronic injury to the superficial flexor tendon of an eventer. This tendon had broken down on at least two occasions but, after treatment, repaired fully and never gave trouble again. 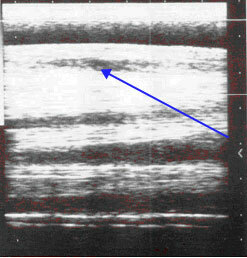 From the picture on the right it is easy to recognise the longitudinal arrangement of tendon fibres. The success of treatment is its ability to restore this essential feature to damaged tendons. 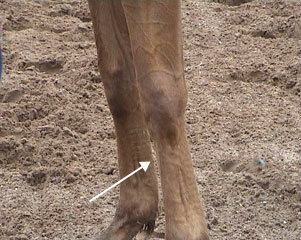 This mare has an old tendon injury for which she was fired. The left-hand arrow indicates the bow on the right leg although, as is usual practice, both legs were fired. 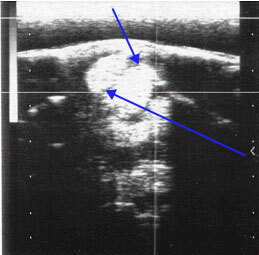 The upper arrow on the right picture shows the lower end of the right triceps muscle, which had extensive damage likely to have preceded the tendon injury. The X indicates the position for the TENS/EMS pad to the outer side of the forearm. The lower arrow shows the position of the superficial flexor muscle at the back of the leg and the middle arrow shows, on the inner forearm, the position for placing the inner treatment pad, directly inside the outer.